Linda graduated with her DPT in 2016 from Ithaca College in Upstate New York, where she also attended undergraduate school and is originally from. She has clinical experiences working with individuals in the outpatient orthopedic and sub-acute inpatient rehabilitation settings. Her interest in physical therapy stems from receiving therapy herself while growing up, participating in many sports her whole life. She also worked as a certified personal trainer while in school and continues to maintain her certification. 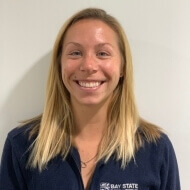 She enjoys working with the athletic and pediatric populations, with additional interest in neurologic conditions and manual therapy. In her spare time, she enjoys maintaining an active lifestyle. She has run the Boston Marathon several times for charity teams, and also enjoys hiking and pursuing a secondary career in slow pitch softball. Being from New York, she keeps her sports teams to herself but loves watching games and exploring Boston.